With household budgets tight and the cost of college rising every year, do you ever question whether putting aside money for a child’s higher education is worth the effort? How on a small salary, you may ask, can I ever save enough money to make a difference? The answer is that every dollar you save today will show its value in due time. By starting now, you are giving your money time to grow. Regular savings of even small amounts of money in a UESP account can make a vital difference by the time your student attends college or vocational school. 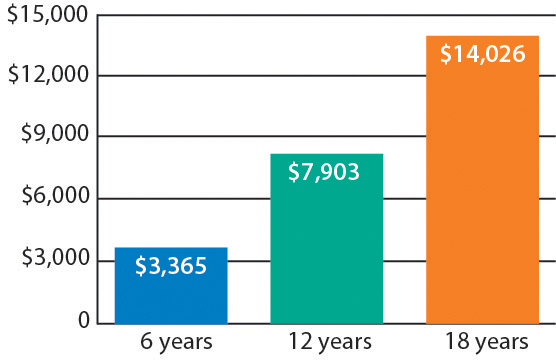 The accompanying chart shows the estimated outcome of saving $40 a month in a UESP account over six, 12, and 18 years. The projections assume that you initially contribute $40 when the account is opened, continue to contribute $40 each month, and that your account earns a 5 percent rate of return compounded monthly. Every dollar you save now is a dollar you won’t need to borrow and repay later with interest. All numbers are UESP estimates. Earnings on a UESP account assume a contribution of $40 at account opening, continued contributions of $40 each month, and that your account earns a 5 percent rate of return compounded monthly over 18 years. The average annual cost of books and supplies at a public, four-year, in-state college or university is $1,250, according to the College Board. Saving $40 a month for six years could defray the cost of textbooks for 2½ years. Tuition and fees at a public, four-year, in-state institution averaged $9,650 in the 2016-2017 academic year, according to the College Board. Saving $40 a month for 12 years might pay tuition for one semester, as well as books and supplies for three semesters. By contributing $40 a month to your account for 18 years, your savings and earnings might be sufficient to meet almost two years of tuition and fees at an in-state college or university. Contributing to your account regularly can require little or no effort. Many employers offer payroll contribution plans to simplify saving for higher education. You can also set up automatic electronic contributions from your bank or credit union. A Utah taxpayer can contribute all or a portion of a Utah state income tax refund to his or her UESP account.